Calling all French/Bilingual jobseekers – we want to meet you! Join us next week at the 4th annual Bilingual Job Fair hosted by Les Services D’Emploi du Centre Francophone de Toronto. 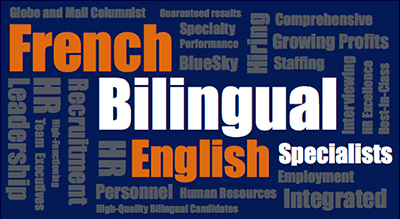 Your bilingual skills are in high demand, and the BlueSky Personnel Solutions team can connect you with employers looking for candidates just like you. This is your chance to meet our team in-person. Start your career conversation with us today! Location: 55 JOHN ST. (Rotunda room of Metro Hall).